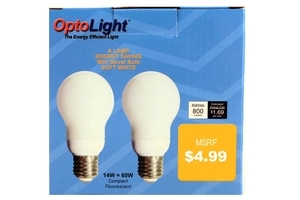 OptoLight Energy Efficient 14 watts Light Bulb. Soft White Mini Spiral energy saving bulb. The light Bulb Produces More Light, Using Less Energy. Estimated energy cost is $1.69/year. Product of China. As an ENERGY STAR Mark Partner, OptoLight has determined that the enclosed Compact Fluorescent Light Bulb meets the ENERGY STAR Mark Guidelines for Energy Efficiency. Light output has more than 5 Percent decrease when used in base down position than in base up position.